Seeing some smart internet marketers earn huge 4-5 figure incomes in $$$ every month from affiliate marketing networks, more and more people are turning to it as a means of sprucing up their earnings. The huge popularity of these affiliate networks is partly because most of us are not happy with what we are doing at present and would not mind trying out alternative methods of earning which require little investment and the freedom to work at the oddest of hours. Not only that, this online earning method fetches handsome rewards for anyone with smart work instead of back breaking labor and without being answerable to a grumpy, old boss. While the temptation to bite the bait is too strong and almost each one of us would like to get started with affiliate marketing as a means of earning megabucks, we should not forget that online marketing frauds could get the better of you. You could be working hard to promote and sell an affiliate product only to realize at the end of few months that you have been cheated. And that all the hard work put in by you for promoting services and/ or products being sold by someone else have gone down the drain. All the same, I would also like to mention that NOT ALL affiliate marketing schemes are frauds. There are some companies which have been around for years and are getting huge businesses themselves by rewarding their affiliates well. Like the famous hosting companies Hostgator and Bluehost. Many blogger friends have earned extremely well by promoting premium plugins like SEO Pressor and the Comment Luv Premium on their blogs and websites, making them widely trusted and respected names. Now while these are success stories, I have been pained to see some of my friends being cheated by affiliate networks as well. The question then is how to make out whether a proposed product is reliable or not? How to make out between a genuine opportunity and a fraud? How, then, should we spot the various affiliate marketing scams? This article is not meant to scare away all those who are yet to get started with affiliate marketing. It is meant only to be an eye opener. This is the first thing you need to watch out for before you decide to endorse a product or a service. Legitimate companies will ALWAYS have a professionally built up website. Their sites will have well written out content, no typos and no error pages at all. If a product/ service you plan to promote offers high affiliate paybacks (because of which you want to do business with them) but does not have a website at all or has a poorly functional site, that should ring a warning bell for you. Most scamsters reach out to unsuspecting, small time affiliates simply via enticing emails. If you see no website or a badly designed one, strike them off your chart straight away! A genuine, dependable affiliate network will always provide its affiliates with affiliate support. Infact, if you see the company having an Affiliate Representative to handle affiliates’ queries, it means they take good care of their affiliates. Do they have a Live Chat/ Live Support system in place for affiliates? Do they have a dedicated telephone line (preferably Toll free) for you in case you sign up with them? Remember that YOU will be answerable to the people who carried out the sales transaction for you. It is, therefore, important to ensure that you should be able to contact them for any issues that may arise as you do the marketing for their products. If you are satisfied after checking out the two points listed above, proceed ahead and ask the company to provide you with testimonials. Now you might want to point out that almost ALL affiliate networks put them up on their websites without having to ask for them. This is EXACTLY what we want to point out. Look beyond the testimonials put up by THEM on their website. They could all be fake, for all we know – smart scamsters can get them written from writers and post them. Ask them for names, email addresses and phone numbers for people who have dealt with them in the past. Talk to them and see how the program worked for them. Better still, try to locate them yourself. You can also try to Google the name of the proposed company along with the words SCAMS or FRAUDS typed next to it to check if there have been any online scams involving them in the past. If you see lots of search results, drop the idea altogether. If you see one or two odd people spewing venom against them, you could choose to ignore them. After all, those might be competitors or people who were not cut for those programs. At the same time, if you are unable to dig up ANYTHING about the proposed affiliate network, take that as another RED signal! Dependable affiliate networks which have been around for quite some time should have SOME track record. Which brings us to the next thing we need to watch out for. As far as possible, opt for affiliate networks which have been around for some time. Try to avoid the new entrants to the market. Even if they are offering you a very high payback, do NOT be enticed into it. If they are really good, they will be around even after the next 10 months or so. Wait for some time and keep a watch over their online activities. See how they deal with their affiliates and look all positive and negative testimonials left behind by those who buy their products. If they actually have something REALLY good, you will have lots of time to make money out of it. Don’t take a rash decision for which you might have to regret later. A genuine affiliate network will not offer you ridiculously high percentage of commission. There have been instances of networks offering their affiliates as much as 80% of the sales proceeds. I always eye such networks as untrustworthy or shady. Do a VERY VERY thorough online as well as offline check to make sure that they have had satisfied affiliates in the past. As I have always maintained, if anything over the internet sounds too good to be believed, it probably isn’t worth a second thought. Even if their affiliates are satisfied, their products/ services might not be upto the hype they are trying to build up for it, which is why they are offering you an outrageously high share of the total sales proceeds. Here again, I would like to point out exceptions. Companies like Hostgator have been paying an extremely high amount of $65 for every hosting signup through their affiliates. Since the monetary cost involved in building up an affiliate network is not too huge, the temptation to sign in for any affiliate network which offers a good commission is too strong. But do not let get yourselves being ensnared into yet another online scam. You might not have to invest too much into the network you are thinking of signing up for monetarily but you will surely have to put in a huge effort and lots of time before you can actually process any sales. 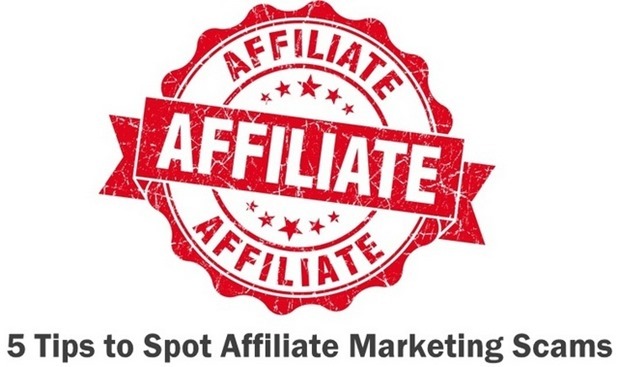 If you do not want to bite the dust after having worked hard, make sure you keep in mind all the points listed above lest you fall prey to the numerous online affiliate marketing scams. "5 Tips to Spot Affiliate Marketing Scams", 5 out of 5 based on 1 ratings. How Sundar Pichai Became The Most Powerful Indian Inside Google? Really thanks to the author mrs ambika choudhary this article is really helpful to me who wants to work as a affiliate and also to upenyu i am going to follow your website. But i really needs the guidance for being an affiliate. l wish l had read this article before falling for the hype of an affiliate program that was offering 100% commission. l only realized that it had a lot of up sells and the 100% commission is only for your initial sale and for a very low value product. l was pained after loosing the little cash l had borrowed from a family member. Now l have decided to create my own website http://avertscams.com/ and alert others of this scam. Most scams operate using landing pages with only an opt/in option and then they send you lots of offers. Keep up the good work. i have very less idea of working as a affiliate but reading such feed back about the fraud and cheating now will check all the required information before suggesting or promote the product to anyone.